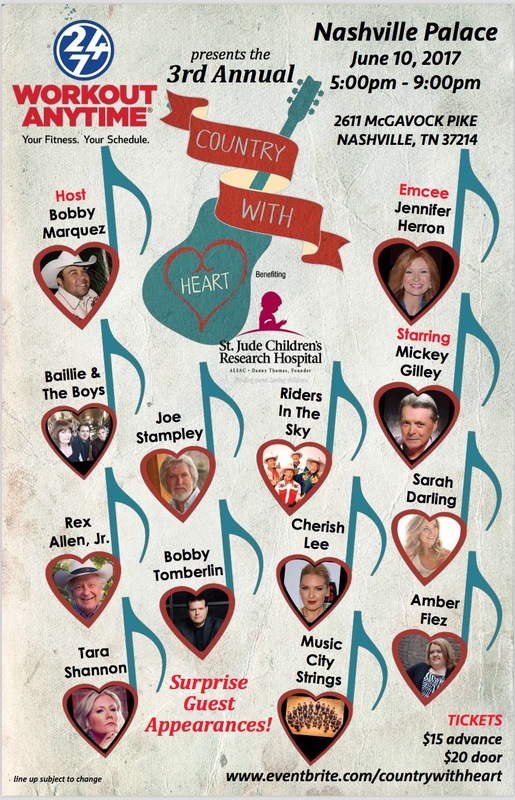 Country With Heart to benefit St. Judes Kids! Nashville, TN, June 05, 2017 ” Country With Heart” Producer and Host, Bobby Marquez has confirmed the addition of Nashville’s Artist to the Stars, Corey Frizzell, to make a special Mickey Gilley presentation during the 3rd annual star studded event to raise money for St. Jude’s Children’s Research Hospital. WORKOUT ANYTIME 24/7 presents the 3rd Annual “Country With Heart” concert and auction during the last weekend of CMA Music Fest on Saturday, June 10th at the Nashville Palace. Confirmed artists are; Mickey Gilley, Joe Stampley, Bailie and the Boys, Riders In The Sky, Rex Allen Jr., Sarah Darling, Bobby Timberline, Cherish Lee, Music City Strings, Tara Shannon and Amber Fiez with Artist to the Stars Corey Frizzell and son Baby Ryman Shafer Frizzell. Singer/songwriter Bobby Marquez will host. Money raised goes directly to St. Jude Children’s Research Hospital. The auction includes one-of-a-kind Opry memorabilia, family zoo memberships, an acoustic autographed guitar and an original guitar art piece paired with other surprises. Through an association with the St. Jude Buck Creek Trail Ride, so far, donations have topped a hundred thousand dollars over the past two years. Tickets are $20 at the door the day of the event, Sat June 10th, 2017, at The Nashville Palace, 2611 McGavock Pike, 37214. 5pm to 9pm.